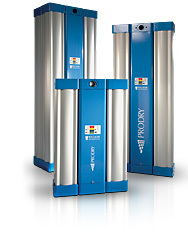 The Walker Filtration range of PROSFD heatless desiccant compressed air dryers have been designed to provide a controlled, economical supply of dry, clean air to the point of application. As an important source of energy within all industrial sectors, many processes depend on high quality compressed air to prevent costly downtime, machine damage and product spoilage. The range is supplied with a host of features, including the intelligent electronic processor to manage the cycles of the dryer’s function and the condensate level via computer interface. The dryer also features an XA grade filter housing and electronic drain as standard, a choicrore of pressure dew points to meet the highest standards as specified in ISO 8573:1 and can be installed anywhere in the world with its ability to recognize and operate with many different voltages, making PROSFD a great product for the OEM customer too.